When the elevator doors creaked open, Jo Jo and I were floored. The jet lag, the heat, the PEOPLE- hundreds of them! It felt like we were walking into a zoo. The humidity was palpable; you could smell it, that and the Beijing pollution. Maybe it was just because there were so many people. There were hundreds of moms, dads and little Chinese girls with Caucasian and Chinese brothers and sisters in tow. There were girls wrestling in chairs, children running through the lobby, kids crying, parents talking too loudly and tour guides trying to get a handle on the chaos. The fluorescent lights, brightly colored wallpaper, overly formal furniture and throngs of mismatched foreigners created a cacophony of near terror for Jo Jo. What in the world had we walked into? There were way more than the twenty families we expected. We were shocked. No, we were terrified. This was NOT what we were expecting for Jo Jo’s Chinese Heritage Tour. The stimulation in the lobby of the hotel was at a fever pitch! I watched as my excited, anxious, introverted little girl shrank into a gigantic red chair and curled her legs under her, making herself seem very small, maybe trying to become invisible. I went into my extroverted tour guide/mommy saves the day mode. I told Jo Jo that I would figure out what was going on and be right back. I then introduced myself to someone nearby who might be able to give me more information. When I glanced over at Jo Jo, she had put her backpack in front of her, almost covering her body completely. My heart sank. I spotted someone I thought was a tour guide (a person holding a sign above their head) and walked over to find out what we should be doing. I looked back and saw Jo Jo take out her jacket and put it over her head – nearly covering her face. I could barely swallow; the knot in my throat growing bigger by the second. I signed in and got our travel documents. When I returned to where Jo Jo was sitting, in the gigantic red chair, she was almost gone. The life had been sucked right out of her in this mass of people. Tears filled my eyes, my heart breaking for her. She was NOT in her element but knowing this was our fate for the next 2 plus weeks, I tried to make the best of it and find something with which she could connect. “Look at that little girl, Jo Jo, she looks just like you.” As she put her jacket completely over her head she said, “OMG mom, really?” She was now just a voice - a very unhappy voice. She was also in tears. At that moment I knew exactly what I had done. I signed us up for a birth country tour that did not fit my daughter. I know this stuff; I am in the travel industry. You always fit a trip to the individual – not visa versa. Some people are not made for group trips and that’s ok. That’s why travel companies customize trips. I also realized at that moment that we had two and a half weeks with this group and I’d better figure out how to make the best of it. The trip was actually quite well run. We saw all the major sites in the areas we visited (The Forbidden City, Tiananmen Square, The Great Wall, The Summer Palace, The Terracotta Warriors, the Li River, etc.). We also enjoyed many wonderful activities (holding a baby panda, hiking and riding bicycles on the Great Wall, walking through beautiful temples and parks, etc). So other than spending lots of time on busses, it was nicely organized and the guides were wonderfully informative. The problem was that we left the hotel at 7am most mornings and didn’t return until 8pm most nights. At every stop there were 250+ tourists from our group converging on a site or a restaurant or a park. It was also July in China - hot, humid and throngs of people everywhere. It was just too much for my nine-year old introvert. Too many people, too many sites, too much stimulation, too much heat and not enough time to recuperate and process what she was experiencing. 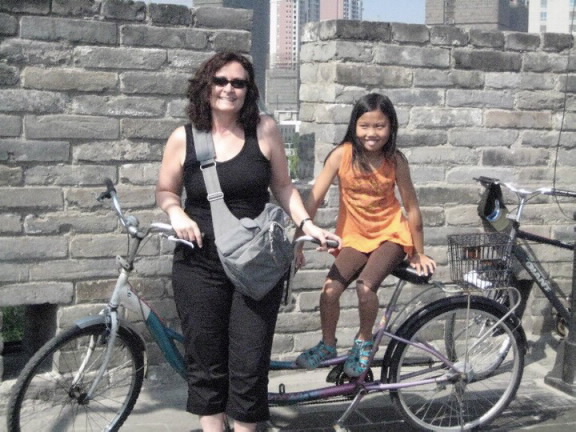 I realized very early on that the only way Jo Jo and I would truly connect and she could enjoy her time in China, was to ditch the trip periodically. On several occasions, we left the group and took a cab back to our hotel. We would go to the pool, walk to a local restaurant or just sit in our hotel room, journal, talk or watch a show on TV. Those escapes taught me a HUGE lesson: when planning a trip of this nature, you must consider the needs of your child! Every time Jo Jo and I went off the grid, we’d have an opportunity to talk about what we were thinking, feeling and seeing. We took time to write in our journals and connect with each other. That was when the magic happened and it was so easy to see. She would go from angry and irritable to cheerful and fun. She would smile and it lit up the room! She asked questions about China, the sites and the people we were with. I could see her coming back to life – in those stolen moments, away from the group and the crowded streets of China. Every child is different, but this was my child, bright-eyed, curious, and thoughtful. I left China knowing I would soon be taking my son, Jac, back to Guatemala for his Heritage Journey and I needed to come up with a plan. I spent more than a year thinking about Jo Jo’s and my trip to China – what was right, what was wrong and what I could do better. I knew there were certain things that were essential for me (1) to foster a deeper family connection (our immediate family, not the birth family or foster family - my family); (2) to build self-esteem and positive self-identity; (3) to cultivate pride in my family's multi-cultural heritage. I took those ideas and tried to come up with a plan to create a successful journey to Guatemala for our family. · What are the needs and/or preferences of each member of your family – their likes and dislikes? · What types of activities does everyone enjoy? Make sure everyone gets to choose something they like. · Importantly, what types of experiences will lead to emotional triggers? If you know them in advance, you can avoid them or at a minimum, prepare for them. · The comfort of each traveler must be considered. I consider this paramount to rejuvenation, connection and reflection of the experience. · Adventure activities are essential (even if it’s soft adventure). These types of activities build self-esteem and as your body releases adrenaline during these activities, it is a catalyst for the release of oxytocin. Oxytocin is the hugging hormone – it helps people bond and connect. Figure out how to include some. · Rich cultural interactions facilitate a deeper understanding and connection to the people and culture of the country you are visiting and are a must for every Heritage Journey. I used these strategies for Jac’s Heritage Journey in Guatemala and it was a huge success. Now I need to get Jo Jo back to China for one more big adventure – but this time, I’ll do it the right way – the way it works for my child!